Ironically, the most alarming military danger between 1793 and 1815 came from the British forces stationed at Newfoundland. In 1797 England was shocked when the crews of warships stationed at Spithead and the Nore mutinied over a number of grievances that were subsequently recognized as legitimate. The mutiny was more in the nature of a labour dispute, but coming as it did during a war with England's great enemy, it was perceived and responded to as a revolutionary event. In St. John's, the foretopmen of the Latona refused to go aloft, an expression of rebellion which prompted Governor Waldegrave to turn to the marines to intimidate the sailors into obedience. Discontent among sailors at the Nore led to a mutiny on May 12, 1797. 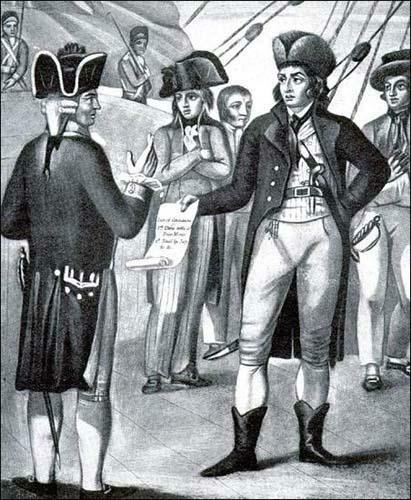 This painting shows the leader, Richard Parker, handing the mutineers' terms to Vice-Admiral Buckner on board the battleship Sandwich. From a mezzotint published July, 1797. From J.G. Bullocke, Sailors' Rebellion (London: Eyre & Spottiswoode, 1938) 246. The Newfoundland Regiment had been implicated slightly in the "plot" and hastened to proclaim its loyalty loudly and unambiguously. However, the harsh discipline of military service had begun to have a corrosive effect on morale, and desertion soon became a serious problem. By 1800 it was the soldiers of the Regiment themselves (most of whom had been recruited locally and were either Irish-born or of Irish descent) that were plotting a mutiny. It is unclear how well-conceived their plan was. The most sensational and lurid accounts insist that the conspirators expected to be joined by a general uprising of disgruntled Irish Catholic civilians. Together they would murder the regimental officers and principal inhabitants, loot the town, then flee to the United States. The plot was exposed, thanks in part to Bishop O'Donel, the ring-leaders seized and tried, and several were executed. Though most of the Regiment was not involved, it was decided to transfer the Regiment out of Newfoundland as a precaution. In the general sense, the "mutiny" on the Latona and the conspiracy within the Newfoundland Regiment can be viewed as expressions of intense frustration and anger with the harsh discipline and service endured in wartime Newfoundland. The situation was exacerbated by conservative and reactionary government policies which intensified during the era of the French Revolutionary and Napoleonic Wars. Yet these incidents might also be viewed as reflections of the stress through which Newfoundland itself was going by then, for the effect of the wars on the fishery had become quite obvious.